Fred Saint Amand Jr. Would Like To Extend His Deepest Condolences To The Many Friends & Family Of Siglancine Racine. Siglancine Racine was born on April 29th, 1934 in Desdunes, Haiti to Paul Joseph, and Previlia “Ya” Previlion. At the tender age of 19 she fell in love with Sacrement Racine and wed two years later. In 1955 she married the love of her life Sacrement Racine whom she has loved for 65 years and with whom she had 12 children. 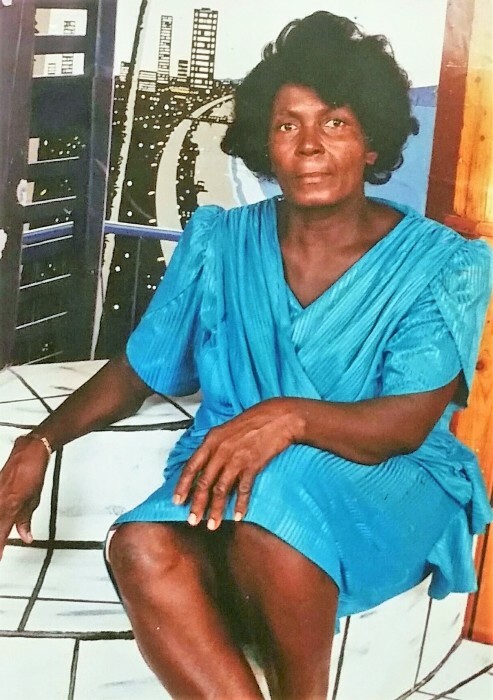 Devoted to her family in April 1995 she began traveling back and forth from the United States but never stayed too long as she always longed for her home in Haiti. Being a woman of God that she was, many people would come from all over just to have her pray for them and make medicinal teas. It was not uncommon to find her praying over people that came to her afflicted with different ailments on any given day. Siglancine was such a joyful person, always laughing and telling jokes with all those that she came across, especially with her husband. She and her husband have always been practically inseparable, and where you saw one, the other was not far behind. Their love was one that many marveled at, as the love that began so many years ago continued and grew stronger as time went on.They always longed to see each other when they had to be apart, and when together seemed as if they were still teenagers in love. This love will be one that everyone will continue to remember and look to as an example of true love, that withstood the test of time. Although she has endured so many trials and tribulations she continued to keep her faith and pressed on as she knew that the one Lord God that she served was all powerful, all seeing and all knowing. These are the teachings that she instilled in her family. On the evening of August 31st 2018 Siglancine could no longer ignore the call of her father and went home to her mansion in the sky. Siglancine Racine also known as "Madame Sacre" is survived by her loving husband, 9 children, 37 grandchildren, and 12 great grandchildren. She also leaves behind 4 brothers, 1 sister as well as 5 son-in-laws, and 2 daughter in-laws.